Antarctica is a rather cold place. Well, I guess that’s putting things a bit mildly. In truth, it is generally seen a being one of the most inhospitable places on Earth, and it happens to be the place with the lowest recorded temperature on the planet (a chilly -89°C/-128°F). Within this frozen wasteland there is a subglacial lake that is 160 miles wide and 30 miles across (257 by 48 km, respectively). This lake has been dubbed Lake Vostok. It is believed that the lake formed some 20 million years ago. 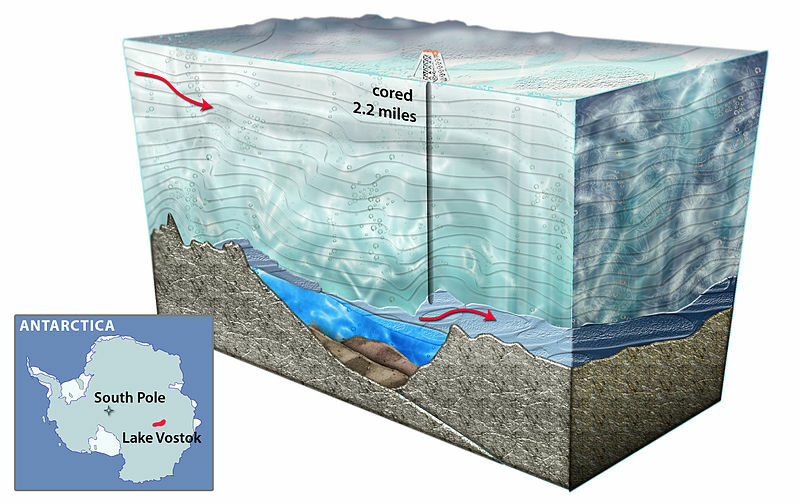 Isolated from the rest of the world for at LEAST 100,000 years, Lake Vostok was one of the last untouched places on this globe. The lake is the perfect place for the study of extremophilic microbial life (and possibly larger organisms) and evolutionary isolation. This inhospitable environment parallels some environments that we think might exist elsewhere in the solar system–places like the subsurface of Mars and icy moons like Enceladus and Europa. Ultimately, the search for life on other planets could start here on Earth – at Lake Vostok. Drilling is restricted to 3590 meters (2.2 miles) below the surface ice (just a few hundred meters above the lake). Ultimately, the lake itself is designated as being inaccessible due to fears of contamination. If even a microbe from the surface reachers the lake, it could greatly skew our findings. Nevertheless, a number of scientists have examined ice cores taken from above the lake, focusing on the so-called “accretion ice” at the base of these cores. Since we can’t get to the lake, this accretion ice is the next bast thing. Accretion ice was once lake water that later froze and adhered to the overlying ice sheet—and what’s in that ice might therefore provide clues to what’s in the lake itself. These ice samples made news in 2013, in the published findings of scientists led by Yury Shtarkman, a postdoc at Bowling Green State University in Ohio. These scientists identified a startlingly diverse array of microbes in the accretion ice—the most diverse sample ever uncovered. They ultimately identified more than 3500 unique genetic sequences (mostly from bacteria, but there were some multicellular eukaryotes). Notably, these are similar to those of creatures found in all sorts of habitats on the planet: lakes, marine environments, deep-sea sediments, thermal vents, and other icy environments. 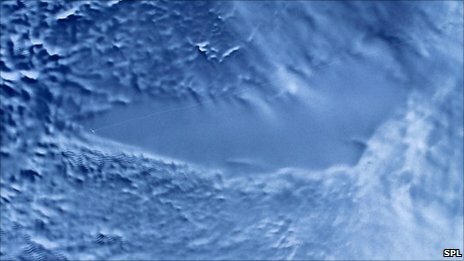 It’s also important to note that Lake Vostok was in contact with the atmosphere millions of years ago, so a complex network of organisms likely populated the lake during that time. The team also found bacteria sequences that are common symbionts (organisms that live in symbiosis with each other) of larger species. As such, there could be the possibility of distinct ecological zones. Unfortunately, since they are just studying accretion ice, the actuality of fish living in the lake remains unclear. Yet, these findings make it seem rather plausible. Either way, this lake is far from being devoid of life. Of course, this does not conclusively lead us to the conclusion that life exists on other planets and moons in our solar system. But if it makes the case that much stronger for those seeking life beyond our planet. Since our findings have revealed that water once likely flowed freely on Mars, it is extremely plausible that life could have existed there. To learn about how this relates to alien life on Europa see this article.